After 6 years as a cook student in France I was looking for new experiences, personal development and new plans. That’s why I applied to join Chilcotin Holidays and I became integrated into the team in may 2017. During my first week I knew that this was the right place to develop my leadership, and I realized how many opportunities are provided here. The first thing that surprised me was my freedom in my post, nobody to tell me what i have to do, when and how, just me and myself in the kitchen. That also meant I needed to assume a lot of responsibilities. It took me a few weeks to become used to my new post, but as I started to get use to it, my personal development was growing. To be in charge of a kitchen is not the same story that it is to be in charge of some tasks in a city job and at Chilcotin Holidays you are in charge of your own post every day. Of course I was not completely alone ! I was lucky to have incredible people ready to help and work with me. And due to this situation I learned how to develop my leadership skills, get the job done while being a good and an inspired person, which has made a huge difference in my personal development. You have to go step by step and be sure you never give up if you want to improve your leadership, it’s a daily practice ! 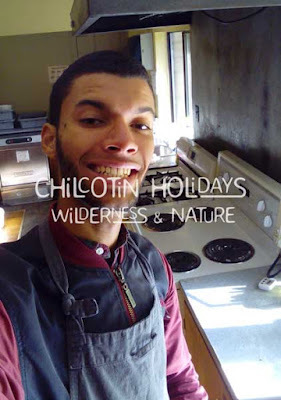 Taking initiative and responsibilities are what you can expect at Chilcotin Holidays, it’s a completly new way of thinking for me, I was used to being just a helper in the french kitchen without any idea of what leadership meant or what being in charge of the whole environment is. Now I know that every day you have something to learn and to improve in order to be a better person in your work and in your daily life. Some books and CD’s about personal development are available here to help me, which provide me with new keys in order to help my progress. To sum up I can’t say everything about my experiences through this one story but here you have a good overview of my reality in the kitchen of the Chilcotin Holidays ranch !